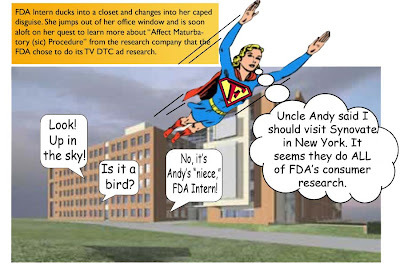 Pharma Marketing Blog: FDA Intern Learns All About the "Affect Misattribution Procedure"
FDA Intern Learns All About the "Affect Misattribution Procedure"
Yes, it's FDA Intern! Strange visitor from an Ivy League school who came to FDA with powers and ability far beyond those of Janet Woodcock or even FDA commish Andy von Eschenbach! FDA Intern! Who can change the course of mighty clinical trials, approve drug ads faster than a speeding bullet, jump through Congressional Subcommittee hoops of fire and ire, and who disguised as Emily Jameson (no relation to Jenna Jameson), mild-mannered intern for a great regulatory agency, fights a never ending battle for fast-track drug approvals, pharmaceutical company user fees, and the FDA way! Today, as every day, FDA spends most of her time reading the Federal Register, where she comes across Docket No. FDA-2007-N-0451, formerly the docket known as 2007N-0321. This docket -- as you may recall from a post made on this blog about 1 year ago -- is about FDA's plans to do a study of consumers to evaluate "the impact of distraction on consumer understanding of risk and benefit information in direct-to-consumer (DTC) prescription drug broadcast advertisements." I previously criticized the methodology of the original study design, which proposed to use a technique called Affect Misattribution Procedure (AMP) to measure consumer reactions. One criticism I had was the use of Chinese characters, which means that people who can read Chinese would be excluded from the study. I submitted my blog post as a comment to the original docket. The FDA obviously took note of my comment but decided against my recommendation to use Mayan hieroglyphics instead of Chinese characters. Anyway, the AMP technique is what interests me and FDA Intern as well. Let's see if we can demonstrate how it works. If you have trouble reading the text in the following panels, just click on the image to get a larger view. Here's the test using the AMP technique that the Synovate CEO set up for FDA Intern. 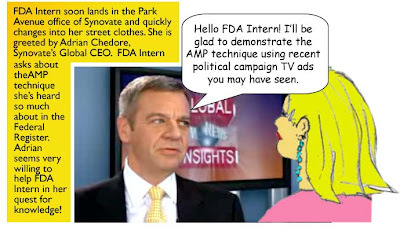 He gave FDA Intern these instructions: "I will be showing you two videos each followed by an picture. 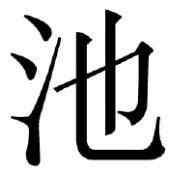 The videos simply give you something to watch before I show you the pictures, which are images of Chinese characters. Your job is to judge the pleasantness of each Chinese character." OK. 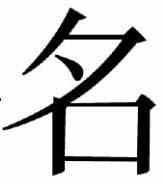 Please judge the "pleasantness" of each Chinese character by clicking here. You'll be able to see the aggregated results from all respondents after you check your answer. Thanks!